The elegant unicorn is seen here in this Portiere De Licorne tapestry, among the forest gardens and near the flag of the commissioner of the original work, Jean le Viste, a nobleman to King Charles VII. The unicorn was a friend of the Lady who was featured in the series of wall hangings and wall art of the medieval period. Here the bunny rabbit and hound are seen decorating the forest themed mille-fleurs background which was a technique used in medieval French and Belgian tapestry production in the middle ages. 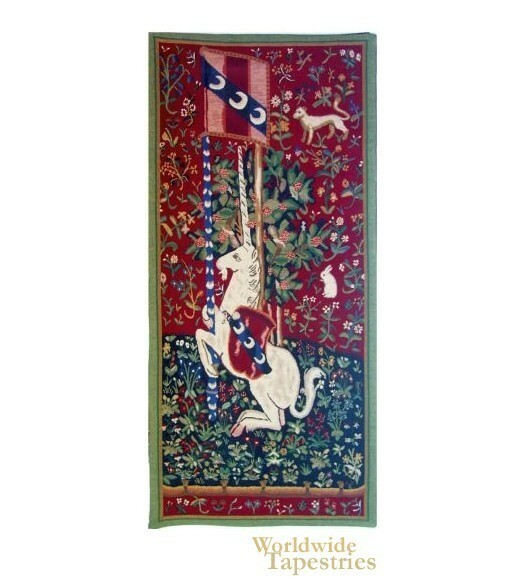 This unicorn art tapestry "Portiere De Licorne" is backed with lining and tunnel for easy hanging.